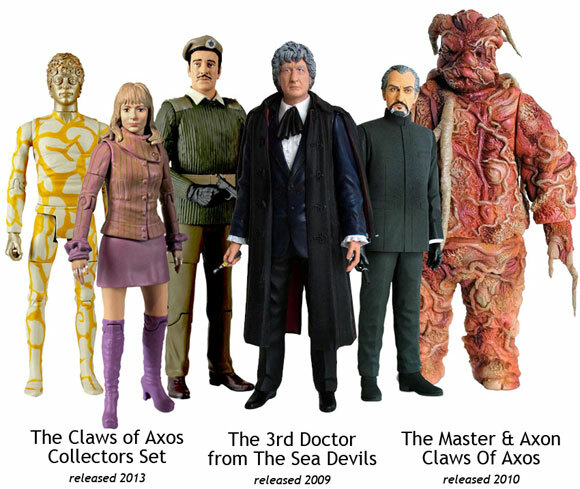 Companions: The Doctor, Jo Grant, the Brigadier, Captain Mike Yates, Sergeant Benton. Monsters/Villains: BOSS, Stevens, Giant Maggots. Brief Synopsis: The Doctor and Jo head to Llanfairfach, South Wales to Investigate Global Chemicals and a dead miner turned bright green. The reputation of The Green Death proceeds itself: "the one with the giant maggots," but there's so much more going on here. Writer, Robert Sloman's "Soylent Green" inspired script simultaneously tackles the environmental issues of pollution, globalisation of the coal mines and the introduction of oil whilst also tipping to the polar opposite of the scale in an (at times) almost pantomimic haze. On paper this doesn't sound like it would be a strong combination, but the strange concoction brings a surprisingly joyous balance. Professor Clifford Jones and some other hippies. 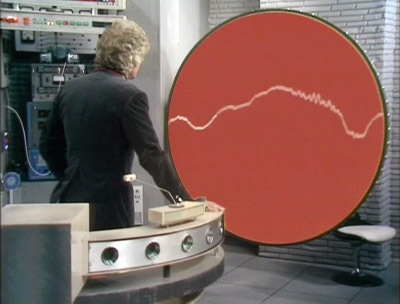 We start this story with the Doctor fixing the space time coordinate programmer, a subtle moment which partially explains the TARDIS' improved accuracy of travel that would follow. 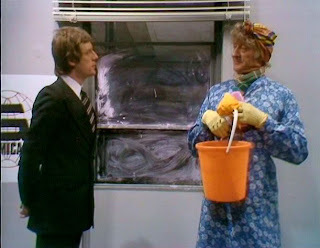 The rapport in the scenes between Pertwee and Manning is breathtaking, you can really tell that we're gearing up for Jo Grant's departure. The Doctor is growing tired of Earth and it's problems, and with his new freedom, clearly wants to explore the rest of space and time. Whereas Jo is growing up and finds a new purpose in life with Professor Clifford Jones and his desires to discover alternative foods and fuels; she even discribes him to the Doctor as a "younger you." 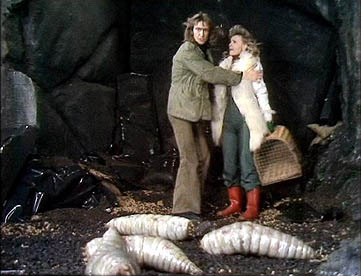 The Doctor goes on a brief tangent to pick up a blue crystal from Metebelis III, a planet where all the animals are giant. Random. 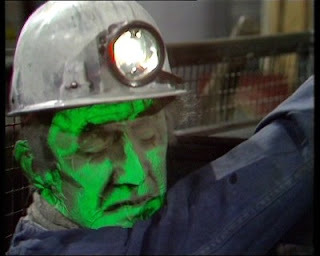 We then head to Llanfairfach, South Wales, where UNIT is investigating a dead miner who's turned bright green. 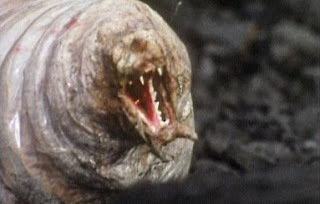 The situation escalates when vast quantities of a green substance and giant maggots are discovered in the abandoned coal mine. It soon becomes apparent that Global Chemicals are behind these aberrations; but who's behind Global Chemicals? Who's the Boss? John Dearth is excellent as the voice of BOSS. The answer is: the first 'Biomorphic Organisation Systems Supervisor,' the BOSS; a computer connected to a human mind, Global Chemicals' director: Stevens. Jerome Willis gives an inspired performance as Stevens. There are some brilliant light hearted moments too. 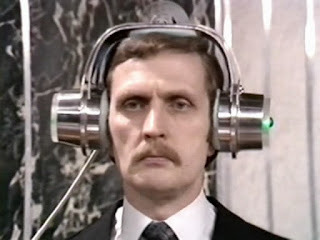 At one point the Brigadier takes a call from the Prime minister: Jeremy. This was a joke by the production team intended to suggest that the Liberal Party, then led by Jeremy Thorpe, could win the next General Election; Thorpe, of course never held that office. 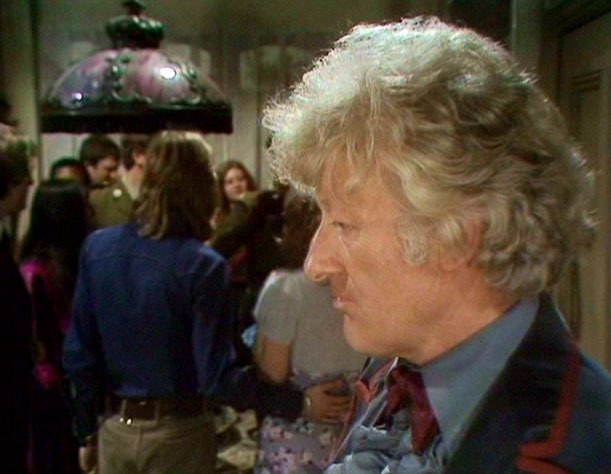 Pertwee's background as a light entertainer is certainly used to it's fullest ever in Doctor Who in The Green Death. In order to infiltrate Global Chemicals the Doctor disguises himself as an old milk man and then to avoid detection as a female cleaner. We get so close to Pantomime at one point there is even a slosh bucket joke. Yates: "I like your handbag." Doctor (in dame voice): "Do you? Well watch out I don't slosh you with it." The Green Death stands the test of time well, Robert Sloman's words in Professor Jones' mouth ring true. It would take twelve years but in 1985 a nutritional fungus alternative to meat would turn out to be Quorn. And in terms of renewable alternative technology for energy: solar, wind turbines and hydro power have all evolved dramatically since 1973. 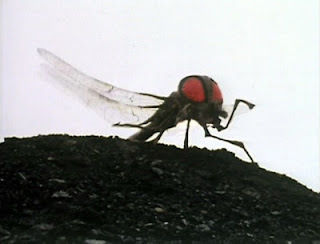 In the end the maggots grow in to giant flys but fortunately UNIT manages to defeat them with Professor Jones' fungus. The BOSS's ultimate plans to link up with other computers round the world and take over the human race are foiled when Stevens fights the computer with the help of the Doctor and the Metebelis III blue crystal. Stevens destroys the BOSS, sacrificing himself and the whole of Global Chemicals. who played Jo Grant actually dating when filming The Green Death. And then Jo decides to leave. Professor Jones offers her the exciting proposal to go with him to the Amazon to search for a rare fungus, and then backs that up with possibly the least romantic marriage proposal of all time. "We'll just stop in Cardiff pick up our supplies, get married!" Jo replies: "Married? You didn't say anything about getting married." To which Cliff replies "Sorry love. You will though?" Hardly high romance yet Jo agrees. 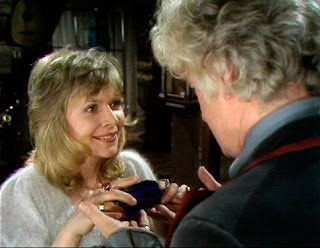 The Doctor offers his blessing to the couple and gives Jo the blue crystal as a present asking them to save him some wedding cake. However, as the party starts to get into full swing the Doctor quietly slips away, noticed only by Jo who understands why. The Doctor, upset by the departure of his good friend, gets into Bessie and after one final look back at the cottage, sadly drives away. It's a beautifully handled departure for the companion. It feels a lot closer to modern Who than any other departures to follow. Jo Grant did eventually see the Doctor again, in his eleventh incarnation in the Sarah Jane Adventures story Death of the Doctor. She is shocked to hear the Doctor is now travelling with a married couple in the TARDIS noting that she only left because she got married. 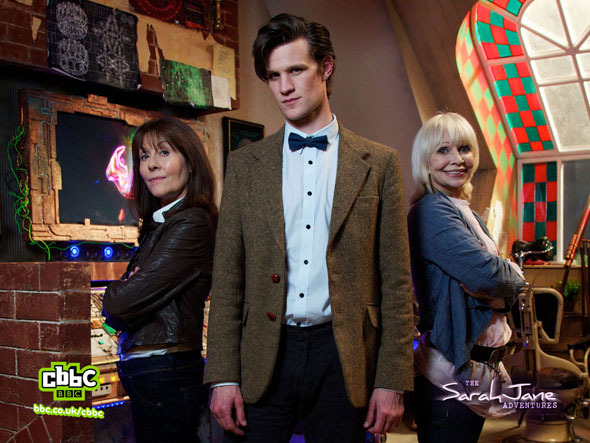 Elisabeth Sladen, with Matt Smith and Katy Manning. 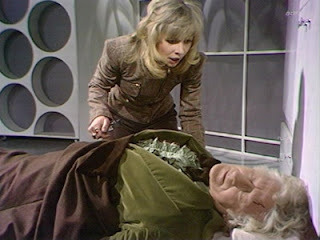 The Green Death is a wonderful farewell for Jo Grant and I have hopefully proven so much more than just Giant Maggots. And so we have reached the end of Season Ten. 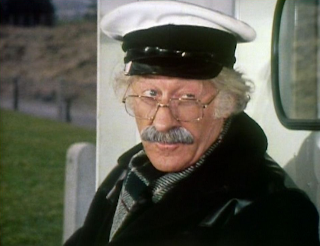 The season in which we saw the return of the First and Second incarnations of the Doctor and met the infamous Time Lord Omega. We watched the Doctor and Jo escape a carnival of monsters. We saw the return of the Master, the Ogrons the Thals and the Daleks and met the wonderful Draconians and the invisible Spiridons. Finally we faced a crazed computer and some giant Maggots and bade farewell to Jo Grant. My favourite story in this season has to be this story The Green Death. My least favourite is Planet Of The Daleks. Out of a possible 50 points I scored Season Ten 32.5/50. Giving it an average score of 63/100 putting Season Ten in eighth place overall thus far. It was a real mixed bag of a season, with some well written and produced gems. I think it was a little too "adventure serial" heavy for my tastes, but I still enjoyed it throughly. Jon Pertwee has really become my favourite Doctor and I'm sad that there is only one more season of his to go, but it's a real corker. Join me next time for a new season, companion, title sequence and reoccurring alien race in The Time Warrior. A documentary based around Doctor Who toys called Doctor Forever! - Celestial Toyroom was recently featured on the DVD release The Aztecs: Special Edition. 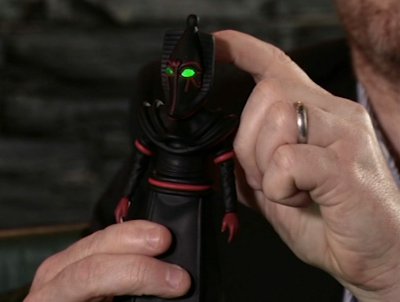 In an interview with Alasdair Dewar from toy company Character Options this new Sutekh figure from the Doctor Who story 'The Pyramids of Mars' was demoed; it features a different head and light-up eyes. - Brigadier action figure in jersey with U.N.I.T. beret and pistol. 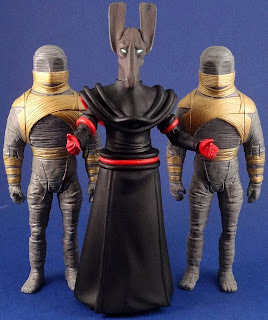 - Jo Grant action figure. - An Axon in Humanoid form action figure. All three look like pretty good sculpts. It'll be nice to be able to put together with other figures from The Claws of Axos. 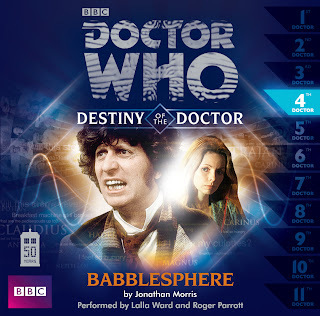 Brief Synopsis: The TARDIS follows a Dalek ship to the Planet Spiridon, where the Daleks are attempting to master invisibility. So... Planet Of The Daleks features a band of Daleks on the planet Spiridon trying to discover the locals' secret of invisibility; the Pepper-pots don't manage to achieve this transparency but the plot's similarity to that of 'The Daleks' more than makes up for their failings. 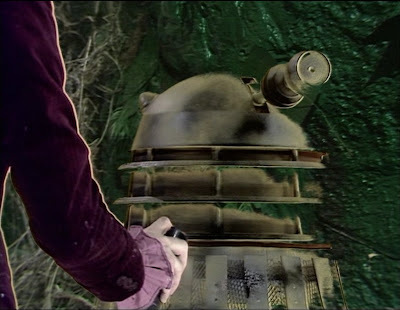 Terry Nation is behind this almost direct reworking of his original story and Planet of the Daleks contains a number of the same plot devices including: a group of Daleks in a city encountering the Thals on a ravaged planet; a deadly plague instead of a neutron bomb; someone using a Dalek shell as a disguise; the Doctor imprisoned in a cell, and the Daleks imprisoned in their city at the end of the story. It just feels like Nation is afraid to do another story, he's had success with his first Dalek story and doesn't want to break the mould. He's invented these wonderful creations but doesn't know where to go with them, he does go on to redeem himself before too long, but we'll have to wait until there's a new Doctor on the scene. 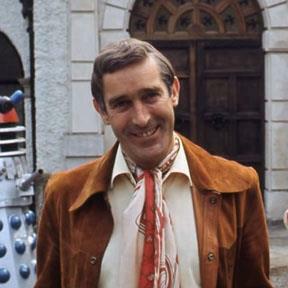 Terry Nation, writer and creator of the Daleks. The story carries on right where Frontier In Space left off, Jo gets a chance to run the show as the Doctor is out cold, literally; this is similar to what happened to him in The Dæmons. On her journeys, Jo chances on the Thals, and a friendly member of the invisible Spiridon race. 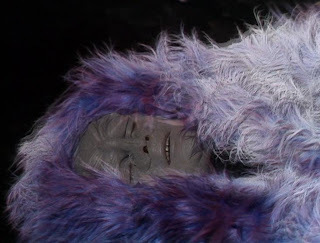 The Spiridons all wear big purple furs to keep warm, and presumably so as to not bump in to each other. Once the Doctor is up and about he too meets up with the Thals and tells them of his past encounter with their people on Skaro, even mentioning Ian, Barbara and Susan, which is a lovely moment. Jo gets given more to do. At first it appears the Daleks are on Spiridon simply to master invisibility; an invisible Dalek is a scary idea, although it really feels like this story line gets forgotten about very quickly. We later learn there are 10,000 Daleks in hibernation on the planet just waiting to awake and conquer the galaxy. Likewise we don't see much of the invisible Spiridons (no pun intended) until one dies and loses his camouflage. 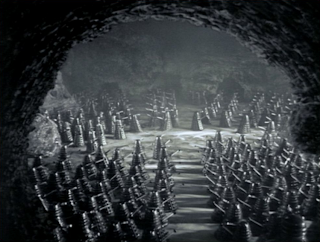 There are some rather infortunate shots using tiny Dalek toys to fill in for the huge 10, 000 strong Dalek army. 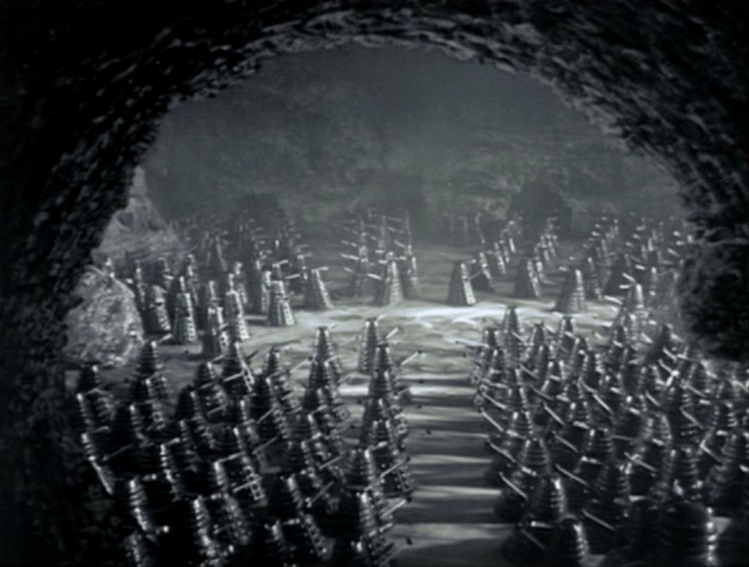 It's a great idea to have such a massive Dalek force but technology wasn't quite there yet leaving these shots best forgotten. An army of tiny toy Daleks. 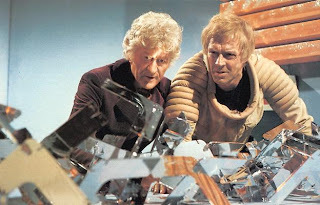 There is a rather wonderful scene in a cell where the Doctor gives a Thal a pep talk about bravery, stating: "Courage isn't just a matter of not being frightened. It's being afraid and doing what you have to do anyway." This has a really genuine heart-warming quality, but unfortunately stands out as the only such moment in the story. The Supreme Dalek, or disco dalek if you will. 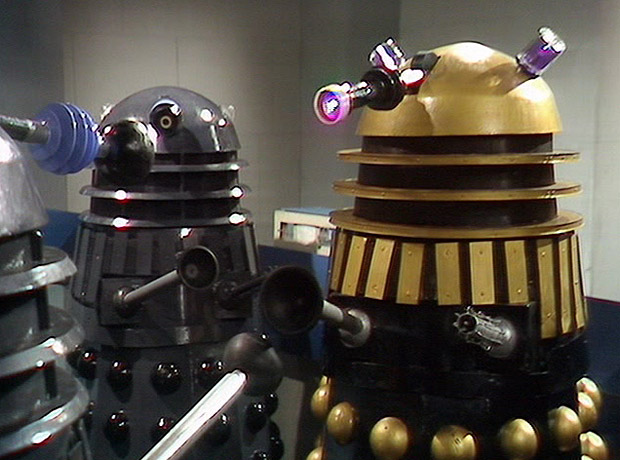 In the end the Daleks aren't destroyed but frozen by a wave of molten ice. The Supreme Dalek (which was adapted from one of the sixties film Daleks) also manages to escape, meaning we can surely expect the Daleks' return at a later date. Jo is given more to do and it's here that one can really see how far the roll of the companion has come during Jo's time as assistant. Her character has grown and developed from a screaming child into a responsible individual. At the end of the story Jo tells the Doctor that there is only one planet she wants to see: earth, home. This is perhaps a little sign post of Jo's departure in the next story. The Doctor and Bernard Horsfall as Thal Leader Taron. Overall Planet Of The Daleks isn't particularly memorable, we've seen it all before in previous Nation stories. 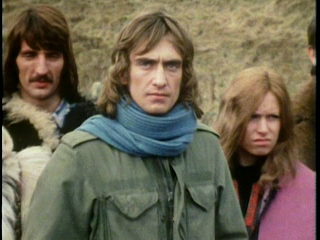 The performances from the actors playing the Thals are two dimensional, with the exception of Bernard Horsfall. 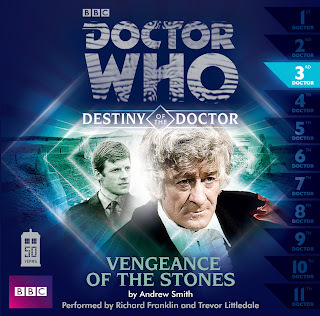 Like it's predecessor Frontier In Space, this story feels like an unwanted throwback to Doctor Who when it was at it's adventure/pulp sci-fi stage of development back in the sixties. 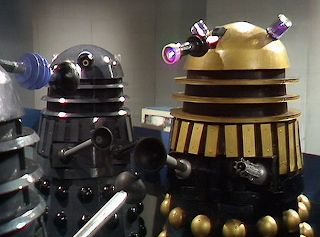 It has to be said that a more up to date version of 'The Daleks,' which hadn't been seen since 10 years earlier would have been welcome at a time where repeats and DVDs were non-existent, but with hindsight the story just feels transparently repetitive. Join me next time for an absolute classic, Season 10's finale and a farewell to Jo Grant in The Green Death.